The Federal Government of Nigeria on Wednesday, February 14, 2018, re-arraigned three men and two companies accused of unlawfully bringing 440 pieces of pump action rifles, and unassembled parts of the same firearm into the country, on May 22, 2017. 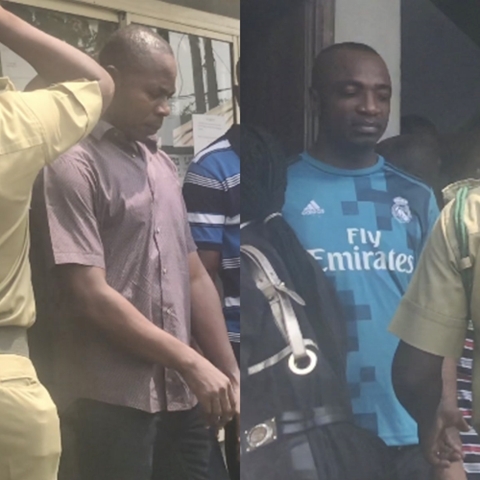 The men - Chihozie Uzochukwu, Mordi Innocent Chukwurah, Ifeanyi Igwewena - two companies; Hizec Marine Services LTD and Patfimo Marine Services LTD, were arraigned in a seven-count charge of unlawful importation, forgery, and conspiracy. Count three of the charge accused them of uttering “a bill of laden No 96114787 issued of the 9th of May, 2017to read “Durban-South Africa” as the point of loading instead of “Istanbul - Ambali - Turkey” with an intent that it will be used and acted upon as genuine. By the customs officer and thereby commuter an offense contrary to section 1 (2) (c) of the Miscellaneous Offences Act, Cap M17, laws of the Federation of Nigeria, 2004 and punishable under the same section and same act”. In addition, count 5 of the charge alleges that defendants forged application to import document (Form M) with the number MF 20170041430, to read Promona -South Africa as the country of origin instead of Turkey. The final count says, “that you Paltimo Morin’s Service Ltd and Mordi Innocent Chukwurah on or about 18th April to 22nd of May 2017, at Tin Can Island Port, Apapa - Lagos within the jurisdiction of this honorable court uttered a bill of lading No 960114787 said to contain “574 packages of Antisera and Cannulate” from Turkey instead of 440 Pump Action Riffles (fire arms) as content of the container No PONU 210024/1 with intent to conceal criminal activity and actual nature of the goods in the container and thereby committed an offense contrary to Section 1(2)(c) of the Miscellaneous offenses Act, Cap M17, law of the Federation of Nigeria, 2004 and punishable under the same section of the same act”. Having read the charges to the five defendants who pleaded not guilty, the defense team argued the bail applications earlier filed before the court. The lawyers argued that the offenses are bailable, adding that bail is at the discretion of the court and hence pleaded the court to exercise its discretion in favor of their clients. The prosecutor, Mr. Julius Ajakaye, opposed the bail application, stating that the offenses are grievous. However, Justice Ibrahim Aikawa, the presiding judge, adjourned the matter to March 14 and 15 for the commencement of trial and ruling on the bail applications. The defendants are to be remanded in prison custody.